Sennheiser PXC 550 wireless headphones are designed for the long-haul | What Hi-Fi? Long battery life, supreme comfort, noise-cancelling technology and a sleek design are all served up in Sennheiser’s latest pair of wireless cans. Sennheiser appears to be in a constant battle with Bose for noise-cancellation supremacy, so with Bose recently introducing its first pair of wireless noise-cancelling headphones, the QC35s, it’s no surprise to see Sennheiser further expanding its range of wireless NC products. Designed for business travellers, the Sennheiser PXC 550 Wireless headphones are the follow-up to the multi-Award-winning Sennheiser PXC 450s, which lost their crown to Bose's QuietComfort 15s in 2007. Sennheiser hopes to win consumers over with the PXC 550s' specification, including a battery life of up to 30 hours (10 more than the Bose). That 30 hours does take a hit when the NoiseGard noise-cancellation is turned on, but Sennheiser says they will still keep you company for a long period on a single charge. A touch panel on the right earcup is used to control music playback and volume, as well as answer and reject calls. The PXC 550 Wireless will also pause music and calls when you take them off. The earcups have been designed “for supreme comfort”, and can be folded away and stored in the supplied carry case when not in use. 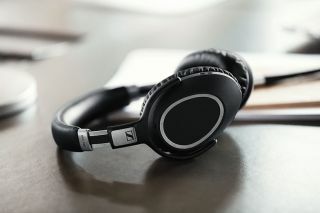 Sennheiser PXC 550 Wireless headphones will be on sale mid-July, priced £330.